I honestly love reading stories like this one because they help me realize that every business goes through struggles and none are an overnight success. So I hope this story will inspire you too and show there are many failed business attempts, mistakes and years behind successful businesses. If you’re looking for advice on how to turn a failing business around, check out: HOW TO TURN A FAILING HANDMADE BUSINESS AROUND…IN 5 STEPS. Today, I can confidently say I run a successful business through the Made Urban Blog. But if I said that a couple years ago, I would have been lying. I wasn’t confident about how my business was progressing and would pray people wouldn’t ask me what I did or how Made Urban was going. I had the idea for Made Urban several years ago and quickly acted to write a business plan, get a loan and hire developers. We spent years and thousands of dollars trying to get the website to where we thought it should be but were constantly struggling to get traffic, no matter who we hired or asked for help. I worked tirelessly to get the word out about the Made Urban MARKETPLACE. On top of conventional marketing efforts (i.e. social media, newsletter, SEO, cold calling/emailing, etc.) I was also working with local craft shows, handing out postcards, going for TV interviews, organizing giveaways, cross promoting online and off and even spending money on ads, as well as SEO and public relation services. A lot of my time was spent reaching out to sellers and asking if they’d be interested in joining the free online marketplace. If you think about average conversion rates of 1 – 2%, you can imagine how defeating it felt to email a hundred sellers and only get a few signed up. The plan was to get the marketplace booming locally (Alberta, Canada) and then once we had a success formula, focus on growing other provinces, then states and maybe even one day, expand overseas. As you can probably guess, we never made it that far. Although the Alberta section of the marketplace did start to catch on and we did begin attracting sellers in other locations, something just wasn’t clicking. I had honestly gotten to a point where I dreaded waking up in the morning and couldn’t fall asleep most nights because of the stressful thoughts running through my head. I was exhausting all my options when it came to marketing and was getting to a point of not knowing what to do. I felt like I had tried everything. Even when I had a new idea that might work, I would quickly poke holes in it and doubt the chances of its success because of my past failed attempts. But, one day, everything fell into place. I had a shift in my mindset, an aha moment and a change of heart and focus for Made Urban. The good news is, I’m now in a much better place with a thriving Made Urban BLOG containing articles that have been read over a million times in the past year, several successful ebooks and a newsletter with over 15,000 subscribers (as of today) and growing. The bad news is, it did lead me to where I am today, announcing the closure of the Made Urban MARKETPLACE. Made Urban will continue to thrive and be a resource for people to find tips, tools and advice for growing their handmade businesses and discovering local events to sell at. However, the MARKETPLACE will be shut down and there will no longer be handmade products for sale on Made Urban. Although the MARKETPLACE technically failed, it really doesn’t feel like a failure, but rather a stepping stone to where I am now. I would have never started a blog or began sharing my advice had it not been for the Made Urban MARKETPLACE. It also taught me a LOT of really valuable lessons, many of which I’ve shared and will continue to share on the Made Urban BLOG. I realize Made Urban is a different type of business than yours (a business selling handmade products), but the lessons in this article apply to any business. If you’re currently feeling defeated, you don’t have to give up. Every single business goes through adjustments and changes so don’t be afraid to make a shift. 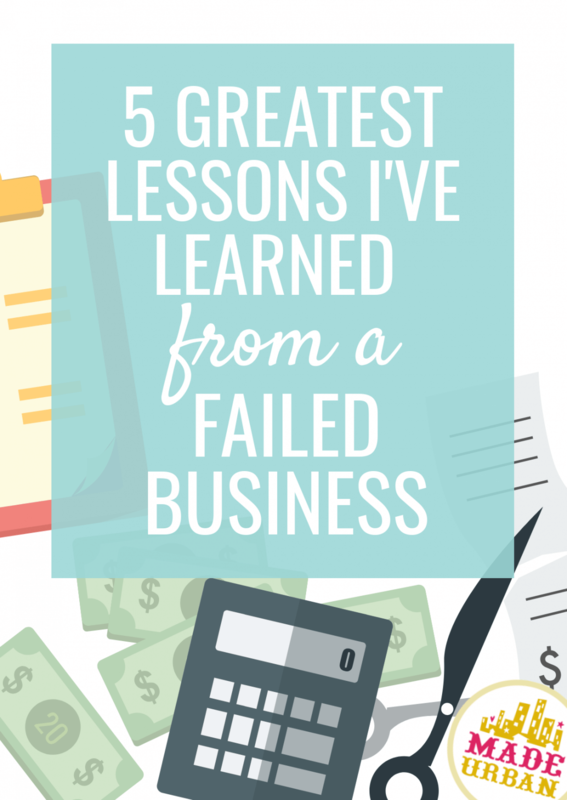 Even if you’re feeling good about your business, have a look over the mistakes that led me to a failed portion of a business so you can be sure you don’t make them in the future. Without a niche, you’re competing with the biggest companies in the world that have millions of dollars to spend on marketing, teams of people and years of experience under their belts. 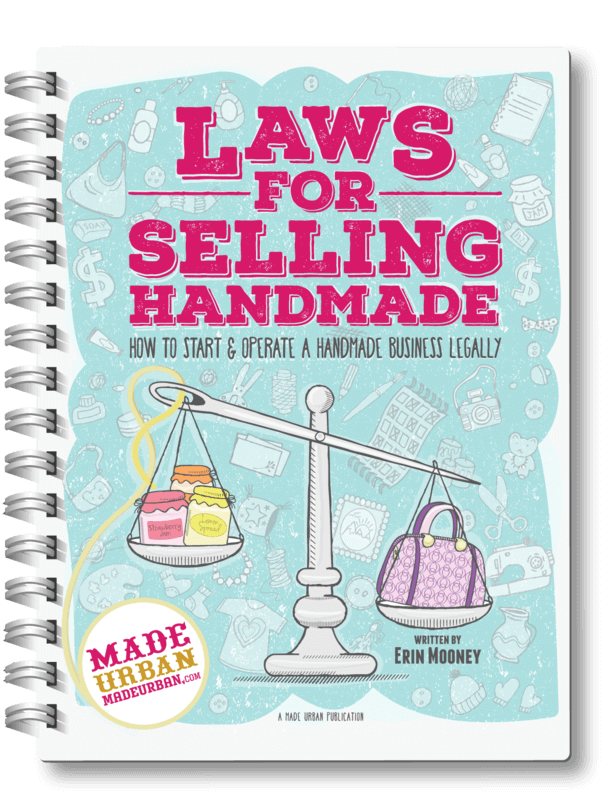 We were focusing on the local aspect of selling online when we started Made Urban, but it wasn’t niche enough and we were ultimately trying to compete with the biggest handmade marketplaces online: Etsy, Zibbet, Artfire and the hundreds of others popping up each month. Were there lots of people I could market the Made Urban MARKETPLACE to by not narrowing down a niche? Absolutely. But it was completely overwhelming. I had hundreds of emails in a spreadsheet before Made Urban even launched, full of businesses that could join. Emailing people on that list was like throwing darts in the dark. I’m sure no one felt I was offering an experience tailored to their business or different from what they were already using (e.g. Etsy). I would have been better off focusing on a niche, for example, handmade business owners selling jewelry. Or gotten even more specific on the type of jewelry, the business model they were following or the type of goals they wanted to achieve. I could have tailored my pitch to appeal jewelry makers, sharing why Made Urban was unique and how our site would benefit their business. That would have been more likely to get more people signing up as a seller. A niche isn’t about reducing how many people you can sell to. It’s about going after an existing group of people being underserved and creating a product or service that’s so perfect for them, they can’t help but be your customer. The Made Urban MARKETPLACE tried to be everything to everyone who sold handmade, which wasn’t successful. The Made Urban BLOG has succeeded because it started with a focus on craft show advice. As it’s picked up steam, I’ve been able to expand to other subjects related to running a handmade business. Part of the reason the Made Urban MARKETPLACE failed is because we didn’t just launch Made Urban as a marketplace. We launched as a marketplace for products AND services, an events calendar, a blog and had several other half-baked ideas. Had we focused on one of those aspects; being just a marketplace for handmade goods OR a website for listing and finding local events OR a blog, we would have saved a lot of time and money. Instead we put a ton of effort into perfecting several aspects of the website and ended up with every aspect being mediocre instead of an amazing event listing site or marketplace or blog. Creative minds come up with so many great ideas but remember, you don’t have to do them all right now. When you’re a small team, or single business owner, with a limited budget, you don’t have the time or money to bring all ideas to fruition at once. Choose the best idea, prove its concept, perfect it, bring in revenue from it and then use the profits to expand. Think about the bare minimum you could get by with and challenge yourself by asking if you really need all the bells and whistles. Do you really need a full website built before you start your newsletter or can you start with one page that has one beautiful image of your work and a sign up form so people can be the first to know when your website launches? We see all the bells and whistles our competitors have and are tricked into thinking we need everything at once. Go as big as you can without compromising quality. It’s better to have a really amazing one-page website than a poorly designed 10-page website. Once you have one part of your business perfectly in place and running smoothly, you can move to the next. I honestly thought: it’s free! Why wouldn’t people join?! I’m sure it’s a mentality many handmade business owners have when pricing their goods. It’s only $5…why wouldn’t someone buy it?! But low prices make people question the value of the product or service or wonder if it it’s too good to be true. If every hairdresser in your city is charging $100 and up for highlights but one is charging half that, wouldn’t you question the quality of their work? Low prices and profits also prevent you from improving your business. Free meant we didn’t have revenue to put back into the business and make improvements for our members, until ad revenue picked up. I thought “free” meant people wouldn’t think twice about joining but I was wrong. People still put a value on their time and end up thinking: how good can it really be if it’s free? Don’t undervalue your work or time, or price it based on what you think people will pay. Think about what you would expect to pay for a high quality item like yours (jewelry, soap, art, etc.) and if it’s higher than your prices, consider raising them. For the longest time, I ignored the fact I was no longer enjoying the work required to market and maintain an online marketplace. I absolutely loved seeing all the amazing products being listed and discovering new handmade businesses. But I really didn’t enjoy emailing people all day, going on local television shows to get the word out, dealing with website glitches, organizing thousands of postcards to be mailed to event organizers, etc. Aside from dreaming up ideas for website improvements, I didn’t get to be creative every day. One day I realized, my favorite days that flew by and didn’t feel like work, were the days I wrote articles for the blog. But in a way, I was resentful towards the blog. I saw how much traffic was going there but I wanted it to be going to the MARKETPLACE. Finally…and thankfully…I had the light bulb moment to embrace the blog’s traffic and focus more of my efforts there. I always paid attention to my stats but I wasn’t letting them guide my decisions. They were clearly telling me the blog was providing more value than the marketplace. When I finally let those stats guide my actions, I started spending more time on the blog and looking for more ways to monetize it. That’s when Made Urban really took off. I was stubborn in trying to stick with my original vision for what I wanted Made Urban to be and where the money would come from. Focusing on the blog was a completely different direction than planned. But when I finally swallowed my pride, admitted what I was doing wasn’t working and open my mind to other possibilities, it was like I had stopped paddling upstream. I still had to work hard to get where I am today but every day didn’t feel like a battle and I was finally being rewarded for all my efforts. Don’t let your ego stop you from recognizing other possibilities and avenues for reaching success. Be willing to go with ideas that are going to be the best for your business. I absolutely knew when things were wrong and we were making a business deal we’d end up regretting. But I’d often push those gut feelings aside because everyone said it’s what we should be doing, I had already taken up someone’s time and felt guilty not hiring them, or because I didn’t want to hurt someone’s feelings or ruffle feathers. I also should have been paying attention to the pit in my stomach that was present every morning. If that’s not a clear sign I was on the wrong path, I don’t know what is. Challenging yourself and dealing with a few nerves or butterflies can be great and mean you’re growing. Spending every day in a cold sweat and being stressed out with a mind full of negative thoughts, is not helpful. You have to be able to believe you can achieve the goal you’ve set out for yourself. Every time I tried to visualize what my idea of success looked like for the Made Urban MARKETPLACE, I was stumped. When I did imagine it as an Etsy-sized marketplace, I didn’t believe in it…or want it. I’m not someone who wants to lead a big team of people, manage hundreds of employees or give speeches to thousands. I didn’t believe I could do what it takes to build a successful marketplace with millions of listings. That obviously reflected in the success of the Made Urban MARKETPLACE. But I did, and do, believe I can run a successful blog, offer valuable advice, write ebooks and help millions of people that way. And I’m doing that today. I didn’t start with a goal of selling my ebooks to thousands and thousands of people or having my articles read by millions. I started with small goals that I had no doubt I could achieve. That way I was excited when I would see 100 people read my new article, not disappointed. As my business grew, so did my goals and I’m now setting ones that would have been unbelievable to me just over a year ago. Although one aspect of my business failed, it led me to a thriving blog, successful ebooks and connecting with thousands of newsletter subscribers and millions of readers. If you were a seller on the Made Urban Marketplace, thanks for being a part of it! I hope you’ll stick around and be a part of what Made Urban has morphed into. And if you’re a subscriber of my newsletter, have joined a free email challenge, purchased one of my ebooks or are just stopping in to read this article, thank you for helping me grow Made Urban into something I never imagined it could be. Do you have any businesses behind you that didn’t work out? Share any lessons you learned in the comments or let me know how you’re feeling about your current business. So proud of you for making a hard decision <3 I absolutely love your books and blog. You've helped me in so many ways and your timing on 'simplifying' is perfect for me right now. As always, thank you for all of the hard work you do for us and for sharing. Thanks for all your hard work. I love reading your articles. Thank you for sharing. I’m sure this was difficult. I have learned alot from your messages. Keep up the good work and good luck on your new venture! Thank you so much everyone! I’m happy to hear you’ve found my messages helpful…a good sign I’m headed in the right direction 😉 Thanks for all your support!! Such a tough decision, but I’m guessing a huge relief when you committed to it. I’m reminded of a quote, “Don’t cling on to a mistake just because you spent a lot of time making it.” Not that the Marketplace was a mistake, but it sounds like it was time to let it go. Thanks Alan and Pixlady! I’ve really enjoyed working with both of you over email and hearing more about your businesses. One of the aspects I love about sharing advice and a sign I’m moving in the right direction. That is the perfect quote to explain the situation. Sometimes our egos want to hold onto ideas to avoid admitting we were wrong 😉 It was definitely time to let it go and it does feel like a big weight has been lifted off my shoulders. Wow, was this perfect timing. I have also come to the realization that I have to let go of a venture that has cost thousands of dollars and countless hours. But also feel the relief you expressed. Definitely a lesson that has had me looking deeper into my behaviors and motivations, leading to a lot of clarity for moving forward. Thanks for sharing this deeply personal journey. Much appreciated! Courageous post, and courageous decision! As someone who has spent literally years trying to fit into something I thought I wanted to do – and teased along by moderate success – I’ve kept trying things to help me walk away from what doesn’t work for me. I’m very new to this site and to craft shows. I did my first one this weekend with absolutely no experience, and made every mistake listed here. As a result, after 7 hours in a very hot room with 49 other vendors, I did not make a single sale. Honestly, I was so disappointed and defeated, I seriously am thinking of giving it up completely. After reading some of your posts here, I decided I might – a very big MIGHT – do another show, making some changes I’ve learned here. The one thing that convinced me I should give it another go, was the idea that people go to craft shows to find unique things. And even though I didn’t sell any, I did hear from a lot of people walking by that my pins are unique. MAYBE. You have helped me tremendously through your blog and e-books. In getting my new business established, after searching through various online resources it was you who provided the cohesive guidance to help me get started and moving forward. So glad that aspect of your business will continue because your knowledge and experience is much needed! This latest blog has been equally valuable so I remember to check the ‘temperature’ so to speak of how I’m doing and what I need to pay attention to as I grow my business. Thanks Erin! Thank you for your honesty and insight into how a business can evolve. I was referred to your page by another artisan as I have just started up a business one year ago. I am currently trying to get a website with an online store going and your words have just given me some insight as to how to examine where my priorities should be. I appreciate your newsletters and the information you share. It has been very valuable to me. All the best. Bonnie – I think that sense of relief is a good sign we’re moving in the right direction:) I also like to think of things showing up in “perfect timing” or in what seems like a coincidence, as a good sign. Good luck in your new chapter! Karen – thanks for reading! I’m so happy to hear you’ve found value in my blog so far. I hope my advice will help you build a successful business and I’m wishing you lots of luck along the way! I enjoy reading your blog. I realized today that I had obviously missed very important (to me) information. I didn’t realize that you were so local! I live in Red Deer. I, also, missed the Marketplace! I have been doing some Acrylic Fluid art and making jewelry, since February. I would dearly love to sell my products and have been researching Etsy as a possibility and I am in the process of using Facebook for this purpose. I am realizing that my research into the different avenues in the venture has been poor! I will need to pay more attention to your Blog, obviously!! I also have had business failures when I was positive that I had a terrific idea. However, at least I can die knowing that I was willing to take risks and give it a whirl. The hardest part is trying to find the balance between giving a business time to try to make a go of it and knowing when to give it up. As always, I appreciate your honesty. I think some of the hardest things for me personally are to listen to my gut, and stop trying to do so much! Glad I’m not alone! 🙂 I absolutely LOVE your blog and ebooks, and I’m so happy to be able to reach out to you for advice! I definitely look forward to what’s next from you! I too have walked in your shoes. This is my third time reinventing my business and thinking I can make a living from my creativity. I didn’t want to do wedding invitations and wanted customers to think differently and purchase 3D birds for their weddings. With the help of your books I have seen my ideal customer and taken on that invitations are the key to my success. Thank you for your journey. Thank you for sharing this genuine account of your Made Urban story. It really confirms the fact that we’re all in this together and that learning is part of the process for everyone. You write very well and I enjoy all your articles. Thank you so much for sharing your “failure”, the thinking process that went with it and your helpful advice to overcome. Best of luck in you future endeavers! Evelyn – hey neighbour! 😉 I’m sorry you didn’t get a chance to discover the marketplace but I hope you’ll find value in the blog and events page as we work on growing those. I’m wishing you lots of success as you venture into selling your work! Annie – I agree! I don’t regret anything and am glad I gave it a shot. I wasn’t sure I’d know when to “give up” on the marketplace and for the longest time, I didn’t have a desire to. But I gotta say, it was definitely clear to me when it was time to move on and it felt right. I believe a big contributor of that knowing was having something else on the horizon that I was excited about growing. Leslie – thank you so much! I’m glad you’ve enjoyed my writing so far and I really appreciate your kind words about it. I hope my advice continues to be helpful to you and I’m wishing you the best of luck too! I really enjoyed this article. It scared me though. I was worried it was your blog or ebooks! Thank goodness it was not, because I get so much out of Made Urban. Hi, Erin! I just want to give you a huge THANK YOU for being open and honest in all your writing, especially this post. Like you said at the beginning, its actually an encouragement to find out that successful business have their ups AND downs too. I think, alot of times, we crafting newbies forget that, and that leads to discouragement. I really appreciate all the time you put into your writing and look forward to learning even more from you in the future! You are a blessing, girl! Thank you!!! You’re clear writing about craft as a prideful business is so relevant and useful. I have taken guidance and validation from your book and blogs. You are ultimately a generous person professionalizing a field most wouldn’t articulate and systematize as you have. I wish you all success. Laura – thank you so much…and sorry to scare you 😉 I’m so happy to hear you find Made Urban helpful! Miriam – this was probably the most honest post I’ve written yet. A little scary to share your failures but not a single business is without them. It is so easy to feel discouraged, especially when you compare your business to someone else’s. Thanks for reading and I hope to continue to be a value to you and your business! Thank you so much for creating such valuable content. I was ready to throw in the towel with my handmade jewelry business. Now I feel reinspired and ready to try things again, but from a different perspective, thanks to your incredibly helpful blog. That’s great to hear Cassaundra! Keep me posted on your progress and I’m wishing you lots of luck! !